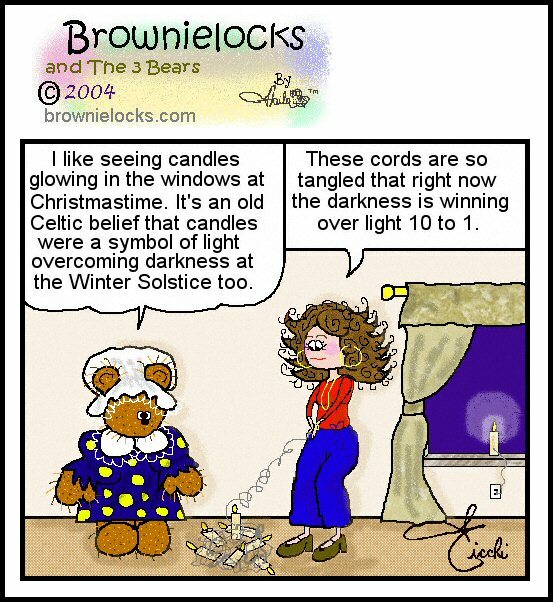 Winter Solstice History, Symbols + Cartoon by Brownielocks. Today observing the winter solstice is rare. But it wasn't in ancient times where it was observed throughout Europe, the British Isles, China, India and Scandinavia. The word "solstice" comes from the Latin word sol stetit, meaning "The sun stood still." The sun rises and sets further south on the horizon in the Northern Hemisphere as Winter Solstice nears. It rises and sets further north as the Summer Solstice nears. For about 6 days in late December (and again in late June), the sun appears to rise and set in almost the exact same spot, which give the solstices their name. The ancient Romans celebrated Winter Solstice with a festival called Saturnalia, dedicated to Saturn their god of agriculture. In the early 4th Century, the Roman Emperor Constantine declared that Christianity would be the new faith of the Roman Empire, the Saturnalia was given a new name and meaning. Saturnalia now as the birthday of Jesus and was from that time on known as Christ Mass or Christmas as we know it today. This is why many of the Christmas customs like the Christmas tree and the Yule Log have more to do with the Winter Solstice than they do with Christian doctrine. Some even believe that the symbol of Santa Claus may originally have been a "solstice shaman" who officiated at the rites that took place on Winter Solstice. The ancient Chinese believed that at sunrise on Winter Solstice, the yang (or masculine principle) was born into the world and would begin a 6 month period of ascendancy. The Hindus (who had a calendar based on lunar cycles) held festivals on the solstices and equinoxes too. In northern India, the people greeted the Winter Solstice with a ceremonial clanging of bells and gongs to frighten off evil spirits. In the British Isles, the Druids celebrated the overthrow of the old god, Bran, by the new God, Bel, at the time of the December solstice. The Winter Solstice marked victory of light over darkness or the end of the cycle of death and decay and the beginning of a new cycle of light, growth and life. It has traditionally been a time for people to celebrate the gradual lengthening of the days and the regeneration of the earth. Fire is the traditional way that Winter Solstice has been celebrated because it symbolizes the sun (and it's warmth). The sun is believed to have its powers increased as the days grew longer. The midwinter traditional Yule Log lighting is an example of an ancient Celtic fire ritual done at the time of the December Winter Solstice. It was believed that to bring the log indoors was a symbolic way of bringing the blessings of the Sun God into your house. It was important that the log burn constantly without going out or else bad luck would follow. Sometimes, wine, cider, ail or corn was sprinkled over the Yule Log before it was lit. In southern England (especially Cornwall) the figure of a man was drawn in chalk on the log. To some this symbolizes ancient human sacrifice by fire. Part of the log was the kept and used to ignite a new log the next year. The Yule candle that is lit in many churches at the beginning of the Christmas season is another example of how pagan rites were absorbed into the Christian religion. The head of the household was allowed to light or extinguish the flame and an unused remnant was preserved as protection against thunder and lightning. In some countries, tallow from the Yule candle was rubbed on the farmer's plow to promote fertility in the fields. Today, the electric candles that are displayed in so many American homes at Christmastime reflect the ancient Celtic reverence for the candle as a symbol of light during the darkest time of the year. The central beliefs of the Teutons was tree worship. The Druids (who built their temples in the woods) also worshiped the trees. The tree was regarded as possessing spirits and was only cut down if absolutely necessary. The ancient Norsemen and the people of Central Asia believed the tree was the symbol of the universe. This belief was also held by Native Americans, as well as the early people of India and China. It is believed that the Christmas tree is derived from this pre-Christian worship. The Romans decorated evergreens and wreaths during their Saturnalia festival. They called the evergreen the "herb of the sun" and favored it during the Winter Solstice time. Today, the popularity of the live, cut Christmas tree has been challenged by the environmentalists. They favor planting a tree around Christmas or the Winter Solstice instead of cutting one down.